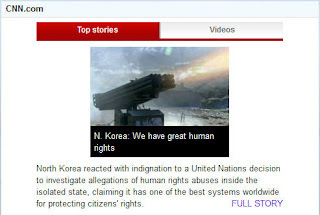 KryptonZone Blog: North Korea has "great human rights"
North Korea has "great human rights"
... Or so they indignantly claimed after the United Nations Human Rights Council in Geneva decided to set up a commission to investigate "grave, widespread and systematic" violations of human rights in North Korea. According the the isolated, authoritarian state, it has one of the best systems worldwide for protecting citizens' rights. Alrighty then. Honestly, I don't want Kim-what's-his-face to send one of his always working and super efficient bombs through my letterbox, but this was really a good laugh to start off my weekend.